provides recommendations for community leaders, funders, and policymakers. Establish healthy behaviors among children and youth to prevent childhood obesity. Increase the availability of affordable healthy foods and beverages in communities. Create safe communities that support physical activity. Increase physical activity and healthy eating among adults. Why Address Obesity in Appalachia? The Creating a Culture of Health in Appalachia initiative has documented key health challenges and opportunities in Appalachia. The initiative’s reports offer a basis for understanding and addressing health in the Region and for identifying factors that support a culture of health in Appalachian communities. A striking portrait of obesity and obesity-related chronic conditions emerged in these reports. Findings suggest that obesity and obesity-related chronic illnesses are higher in the Appalachian Region and contribute to a greater loss of life compared to the rest of the United States. Data from 2015–2016 show that nearly 39.8% of the adult population (93.3 million) in the United States is considered obese. The Health Disparities in Appalachia report provides a more nuanced picture of obesity by examining county-level obesity rates across the United States. These data were derived from 2012 estimates, and important differences in obesity were noted in Appalachia compared to the rest of the country. Findings from that report show the prevalence of obesity in Appalachian counties is higher than in non-Appalachian counties (31% versus 27.1%). The proportion of obese adults was higher across all five Appalachian subregions than what is observed in the rest of the country, with Central Appalachia (34.7%) and North Central Appalachia (33.4%) having the highest percentages. While obesity itself is considered a chronic condition, it is also a driver of other chronic conditions more proximally associated with disability and death in the United States. Cardiovascular disease, stroke, and diabetes are important obesity-related chronic conditions that are also far more common in the Appalachian Region than in the rest of the country. Heart disease mortality in Appalachian counties is 18% higher than in non-Appalachian counties. In Central Appalachian counties, economically distressed Appalachian counties, and rural Appalachian counties, cardiovascular disease mortality is markedly higher than in non-Appalachian counties. While the geographic distribution within Appalachia may vary, stroke and diabetes-related mortality are also disproportionately high in Appalachian counties compared to elsewhere. Previous research suggests that 33% of “diabetes belt” counties are in Central and Southern Appalachian counties. Together, these findings suggest that residents of Appalachia die more frequently from obesity-related chronic conditions than those living outside the Region. While obesity is a complex condition with multiple contributing factors, physical inactivity is a key determinant of obesity and related chronic conditions. Residents of Appalachia are more likely to be physically inactive, relative to those living outside of Appalachia. Across the Region, 28.4% of the population report NOT being physically active compared to 22.6% of adults among non-Appalachian counties. Physical inactivity was highest among residents of Central Appalachia (33.8%), those residing in the rural counties of Appalachia (31.8%), and among economically distressed counties in the Region (33.9%). Obesity and obesity-related diseases are particularly prevalent throughout Appalachia, and understanding to what extent obesity affects a community is an important first step in determining how to target limited resources. Assessing community needs can help community leaders, funders, and policymakers determine which of the recommendations presented in this brief have the greatest potential to reduce obesity rates. Needs assessments are formative research activities that can help communities understand important cultural norms and attitudes that may affect efforts to decrease obesity. They can help community leaders, funders, and policymakers understand the prevalence and nature of obesity in a particular community, including which populations are at a disproportionately high risk of obesity and obesity-related diseases. Conducting a needs assessment will also help leaders take stock of which programs and policies are already addressing obesity and the extent to which they are working successfully. Quantitative data in conjunction with qualitative data from community forums and focus groups can reveal how changes in nutrition, physical activity, and obesity rates have occurred over time and what current barriers exist to creating change. Identifying and mapping community assets are equally important to recognizing challenges, and enable community leaders to take stock of existing resources. Additional resources for conducting community needs assessments, including asset mapping, are provided below. To target limited resources appropriately, community leaders, funders, and policymakers may consider leveraging data from state and national surveys to understand how access to healthy foods and physical activities varies across counties. For example, in 2016 the Appalachian Regional Healthcare System conducted a health needs assessment using multiple data sources, including the U.S. Census and state vital statistics data. For additional data, policymakers may also consider using County Health Rankings to understand how obesity, access to exercise and healthy food, and physical inactivity varies across counties. The USDA’s Food Environment Atlas also offers data on factors such as food prices, food and nutrition services, proximity to fast food, and diet quality. Health coalitions may be able to offer additional data. North Carolina’s Eat Smart Move More Campaign offers a number of data resources that can be used to target program planning. The Creating a Culture of Health in Appalachia initiative compiled data on 41 health indicators—including the prevalence of obesity and physical inactivity—providing a comprehensive overview of health in the Appalachian Region. This Community Tool Box provides an overview of needs assessments. Conducting a Community Health Assessment provides helpful tools and examples for identifying and analyzing data for a needs assessment. Conducting Rural Health Research, Needs Assessment, and Program Evaluation is a collection of resources that communities can use to develop and refine their own research. Discovering Community Power: A Guide to Mobilizing Local Assets and Your Organization’s Capacity is a workbook that provides guidance for systematically identifying community assets. HealthData.gov is a searchable warehouse of health data. Based on assessment of community needs, policymakers, funders, and community leaders should consider which recommendations and associated strategies below would best suit their communities. Many effective models for reducing obesity presented in this brief were part of multipronged efforts that combined community-based intervention with policy changes and health communications. To successfully reduce obesity rates, community leaders, funders, and policymakers should work together to select a set of strategies that complement each other. Reducing the prevalence of obesity in Appalachia could help decrease the prevalence of chronic diseases, such as heart disease and diabetes. This section presents successful or promising policies, programs, and initiatives that aim to prevent or reduce obesity. We also provide examples of intervention strategies taking place in the Appalachian Region. Recommendations for reducing obesity and promoting healthy lifestyles include both system-level changes targeting organizational structure and policy, and individual-level change that focuses on health behavior. It is critical to establish healthy behaviors among children and adolescents to help reduce rates of childhood obesity. Early care and education settings and schools are uniquely positioned to influence a child’s eating and physical activity habits at a critical time in their development. Policymakers, community organizations, and funders must work collaboratively to ensure healthy habits are established among children. According to the Centers for Disease Control and Prevention (CDC), young children who are overweight in kindergarten are four times more likely than those who are not overweight to be obese by the time they have reached eighth grade. Interventions to prevent obesity must begin as early as possible and continue as children age. Early Care Education (ECE) settings include child care centers, day care homes, and Head Start and pre-kindergarten programs. ECE facilities can implement practices that address nutrition, infant feeding, physical activity, and screen time in order to develop healthy eating and activity habits among young children. CDC has developed a framework for obesity prevention, tailored to ECE settings, called the Spectrum of Opportunities. The Quick Start Action Guide provides guidance on the Spectrum of Opportunities framework and action steps on how to institute system-level changes to a state’s ECE system. In 2012, CDC funded a six-year program, the Early Childcare and Education Obesity Prevention Program, which included the development of the National Early Care and Education Learning Collaborative (ECELC). Across 10 states, Nemours Children’s Health System provided practical training and technical assistance on how to make changes within their ECE program to support healthy eating and physical activity. According to one ECELC project coordinator, “In Kentucky, many stakeholders have been hesitant to address obesity prevention practices and policies that impact the operations of nearly 3,000 licensed child care centers and certified homes. [Through this] project, we have been able to shift statewide attitudes so that more stakeholders are valuing and prioritizing childhood obesity prevention efforts.” Community organizations, ECE providers, and policymakers can reference CDC’s 2016 Early Care and Education (ECE) State Indicator Report, which shows how states have incorporated the Spectrum of Opportunities into their ECE obesity prevention efforts. Finally, states can apply for funds from the Child and Adult Care Food Program (CACFP) to provide nutritious meals and snacks for the people they serve. The CACFP website describes key funding opportunities, state policy levers, and system supports for accessing healthy food at after-school care centers, childcare centers, and daycare centers. A focus on providing healthy food and beverages to children in schools has increased over the past decade. The U.S. Department of Agriculture (USDA) Food and Nutrition Service (FNS) administers several child nutrition programs, including the National School Lunch Program, School Breakfast Program, Child and Adult Care Food Program, Summer Food Service Program, Fresh Fruit and Vegetable Program, and Special Milk Program. In 2012, USDA updated nutrition standards for the National School Lunch Program and School Breakfast Program to require schools to increase availability of fruits, vegetables, whole grains, and fat-free and low-fat fluid milk in school meals, along with other changes. Additionally, since the 2014–2015 school year, all foods sold at school during the school day are required to meet USDA nutrition standards. To help schools comply with new nutrition standards, several initiatives aim to increase the availability of healthy foods and beverages in schools, including Salad Bars to School and Farm to School. Salad Bars to School is a unique public-private partnership that promotes and sponsors salad bars in schools. Research has shown that students who have access to a school salad bar eat more fruits and vegetables and add more variety to their diets. CDC created an Action Guide on promoting and supporting school salad bars, which can be used as a reference by stakeholders in the Appalachian Region. USDA’s Farm to School program awards grants to different types of organizations (schools, school districts, nonprofit organizations, etc.) to plan, implement, and/or provide training on farm-to- school activities. 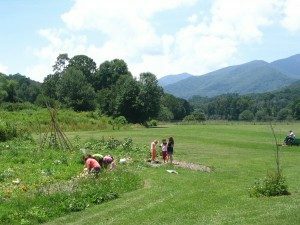 The Appalachian Sustainable Agriculture Project’s (ASAP) Growing Minds Farm to School Program in Haywood County, North Carolina, began in 2002, making it one of the first farm-to-school programs in the country. Growing Minds now works with schools in 60 Appalachian counties, helping them provide farm-to-school experiences to their students. Growing Minds provides seeds for school gardens, mini-grants, lesson plans, and recipes, and also manages a database of children’s literature focused on local food and farms. A critical aspect of improving healthy behaviors in the school setting is limiting consumption of sugar-sweetened beverages (SSBs). This can be achieved by increasing access to healthier beverages and disincentivizing or eliminating the option of sugary beverages, such as soda. An example of an innovative Appalachian intervention is the “Sodabriety” 30-day challenge, which was implemented in two high schools in Pike County, Ohio. A teen advisory council designed the intervention, including promotional campaigns and facts during daily announcements. Results showed that student participation in the challenge reduced both daily consumption of SSBs and increased water consumption. The most effective strategy for promoting physical activity among youth is ensuring children have opportunities for physical activity before, during, and after school. Children can experience substantial health benefits if they meet the Physical Activity Guidelines, which recommend that school-aged youth (ages 6 through 17 years) do moderate- and vigorous-intensity physical activity for at least 60 minutes each day. CDC recommends the Comprehensive School Physical Activity Program approach, which encourages schools to promote physical activity before, during, and after school, while also incorporating staff involvement and family and community engagement. Design an enhanced school-based physical education program. Incorporate physical activity opportunities into regular classroom activities. Establish formal policies or agreements, such as joint use agreements, to allow schools to use nearby fields and parks for before-, during-, and after-school physical activity opportunities. To support individual behavior change, the environment in which a person lives must promote healthy eating through the availability of affordable healthy foods and beverages. Increasing access to affordable healthy foods can be achieved through both community-based and policy-based strategies. Bringing affordable, healthy food options into communities throughout Appalachia requires collaboration between local farmers, community leaders, nonprofits, and funders. For example, a community can establish a farmers market or community and school gardens. Farmers markets can apply to become authorized to accept Supplemental Nutrition Assistance Program (SNAP) and Women, Infants, and Children (WIC) benefits. SNAP offers nutritional assistance to low-income citizens, and WIC offers nutritional assistance, formula, breastfeeding assistance, and supplies to low-income mothers and their children. Both programs serve vulnerable populations and are a vital tool for increasing access to nutritious foods. The Kanawha Valley Local Food Project is an initiative of the West Virginia Food and Farm Coalition that helps establish farmers markets and make them accessible to people of all incomes, including SNAP and WIC recipients. Other nonprofit organizations and funders can use charitable donations to provide food to those in need throughout their communities, while also encouraging healthy eating behaviors. 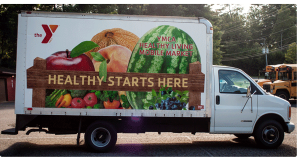 As highlighted in the Bright Spot case studies report, in Madison County, North Carolina, the School Health Advisory Council (SHAC) launched a food truck program that provides free fruits and vegetables to county residents. 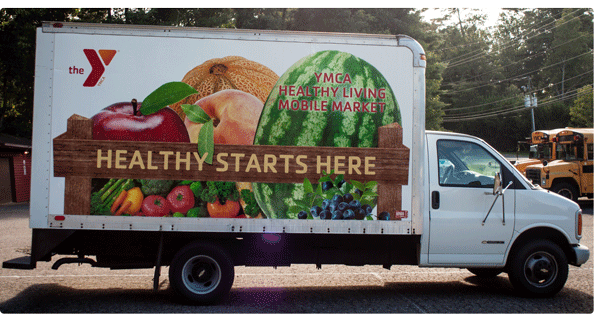 Similarly, the Healthy Living Mobile Market is a vehicle operated jointly by the Madison County Health Department and the YMCA that delivers free fruits and vegetables to low-income residents around the county. Additionally, the Madison County extension office operates a food hub program that helps small-scale local farmers bring their products to market, and also provides a place where low-income families can obtain high-quality organic produce at low prices. Policies that encourage and incentivize participation in programs that increase access to healthy foods and beverages are critical. Policies can be targeted at different groups, including farmers, retailers, and consumers. Incentives for farmers include implementing a farm-to-food bank tax credit, which provides an incentive through a tax credit for farmers if they donate their products to local food banks. This legislation was passed in West Virginia, modeled after previous legislation in Kentucky. West Virginia also passed legislation that established a single statewide permitting process for farmers market vendors. Research has shown that offering incentives to SNAP and WIC participants, such as coupons that double the value of their dollars if spent on fruits and vegetables, can increase fruit and vegetable consumption. The Pennsylvania Fresh Food Financing Initiative offers a model for public-private partnerships for increasing access to healthy food. The program created incentives for supermarkets and grocery stores to serve rural and underserved communities, and was effective at providing healthy food and reducing incidence of diet-related diseases. Access to supermarkets and grocery stores with healthy food options is often limited in Appalachia, particularly in rural areas. Zoning and tax policies can be implemented to encourage grocery stores to locate in specific areas. However, in order to increase consumption of healthy foods, comprehensive strategies are likely necessary to address other influences on purchasing, including marketing and pricing of healthy food. Organizations such as schools, universities, and healthcare facilities can also create organizational policies that promote healthy beverages rather than sugary beverages. For example, the University of Michigan Health System stopped selling sugary beverages in its health centers, administrative buildings, and medical school. Some localities have enacted a sugar-sweetened beverage tax to disincentivize consumption of sugary drinks. Public health advocates in West Virginia have supported an increase on the sugar-sweetened beverages tax that was implemented in 1951. They hope the tax will help prevent the continued rise in diabetes and obesity rates in West Virginia, and generate revenue to fund health care and obesity programs for low-income individuals. For other jurisdictions interested in pursuing this policy, Change Lab Solutions has developed a Legal and Practical Guide for Designing Sugary Drink Taxes. Ensuring that communities encourage physical activity is critical for reducing obesity among all age groups. Strategies discussed in this section focus on changes to the physical environment that facilitate higher levels of activity among people of all ages. Research demonstrates that an environment with barriers to safe exercise will decrease the likelihood that a child will choose physical activity over indoor activity, such as watching television or playing video games. To reverse this trend, many states and localities invest in public trails, parks, and recreational facilities. A national study of U.S. adults found that access to public parks and trails was associated with higher levels of physical activity among people of all age groups. Changes in access to transportation and public land such as parks will be crucial in maintaining an environment that is conducive to walking, biking, and playing outside. Community organizations, funders, and policymakers can work together to change local environments to create opportunities for physical activity. Changes can include creating or improving walking trails, building exercise facilities, or providing access to existing facilities. For localities that cannot set aside public funds for maintaining parks and recreational centers, private grants are available. For example, Investing in Kentucky’s Future (IKF) was a $3 million grant that implemented various health programs across seven communities. Recipients could use their grants for a wide range of preventive health initiatives, such as building parks, increasing access to fruits and vegetables, and integrating mental healthcare into schools. Clinton County, Kentucky, used its funding to build walking trails to schools and add exercise equipment to public parks. A program evaluation of IKF by the Foundation for a Healthy Kentucky showed changes in health behavior, including increased physical activity. Making an environment more conducive to physical activity can change the way people travel to work and school. The Safe Routes to School Program modifies current infrastructure and offers education and incentives for children to walk or bike to school. By making travel safer for students, communities can increase their physical activity on the way to school. Meigs County, Tennessee, was able to open a walking trail to its elementary school through an Appalachian Diabetes Control and Translation Project (ADCTP) grant. States and cities can also adopt a “complete streets” approach, which can include developing bike trails, safe routes to walk or bike to school, and widening roads to make more room for pedestrians and cyclists. The North Carolina Department of Transportation adopted a complete streets policy in 2009, which built and enhanced bike and pedestrian trails across the state. This project included improving roads and trails so that children can walk or bike to school. Public parks and recreational facilities offer another opportunity to foster increased physical activity and social cohesion. Creating and maintaining public facilities ensures that children have safe places to be outside and gives the community at large a place to meet and hold events. Research has shown that creating a public place to exercise improved all measures of physical activity, including aerobic exercise and general energy expenditure. Examples from other cities show that people will use parks if they are properly maintained. The Exploring Your Own Backyard project, which takes place along the Cumberland River in Kentucky and Tennessee, offers a broad range of recreational opportunities for children, including hiking, biking, and kayaking. The program is funded through federal grants and community partnerships, which could be similarly leveraged in other Appalachian counties. Smart Growth America offers guidelines and a model for complete streets policy. Department of Transportation offers a complete guide that includes evaluation materials and implementation considerations. An Action Guide from the CDC and Partnership for Prevention details the implementation process of constructing and maintaining public land. National Recreation and Park Association tracks grant availability for maintaining parks and recreational centers. The Appalachian Diabetes Control and Translation Project (ADCTP) offers information on and funding resources for infrastructure change. The first three recommendations have focused on strategies that support communities that promote healthy behaviors, which are critical first steps to improving outcomes related to obesity and related diseases. However, in order to reduce the prevalence of obesity in Appalachia among adults, individual behaviors must change. The following strategies can stand alone, though they can also be combined into comprehensive behavioral interventions. We discuss several strategies that have been recommended as effective interventions by the Community Preventive Services Task Force (CPSTF), a resource for selecting evidence-based interventions for improving health and preventing disease. The average employee spends more than one-third of their day at the workplace. Given the major role that work plays in an individual’s life, worksite wellness programs can significantly improve employees’ behavioral health and overall quality of life. Establishing a multicomponent worksite obesity prevention program is one intervention included in CDC’s Health Impact in Five Years (HI-5) initiative. Employers may implement worksite obesity prevention programs separately or as part of a comprehensive wellness program. The typical worksite wellness program includes—but is not limited to—weight control interventions, physical activity opportunities, access to private breastfeeding areas, smoking cessation programs, and stress management resources. Designing and implementing a worksite wellness program can be done through organizational policies and programs, or by supporting legislation such as tax incentives for businesses to design one. The Kentucky Department for Public Health used a health impact assessment to analyze the impact of a worksite wellness tax credit on several outcomes, including obesity rates, social cohesion, and job creation in the state. Following the assessment, a worksite wellness tax credit was introduced in the state legislature. Community-wide campaigns to increase physical activity using highly visible, multicomponent strategies are a vital tool for reducing obesity through behavioral changes. Successful community-wide campaigns involve collaboration between different sectors, such as medicine, early childhood professionals, social services, and educators. Ideal components of a community-led program are detailed in the CDC’s Guide to Strategies to Increase Physical Activity in the Community. An example from Sequatchie County, Tennessee—a Bright Spot case study community—is Step Up Sequatchie: Improve Your Health One Step at a Time. This project includes community-led programs that educate people and provide resources on healthy eating and physical activity, in addition to smoking cessation. Volunteers have sponsored multiple health screening events and teamed up with the University of Tennessee to improve exercise facilities and physical education offerings in schools. This multifaceted project strengthened the reach of each intervention, reflecting a desire to create an overall culture of health that emphasizes sufficient physical activity and healthy habits. A large body of evidence suggests a positive association between increased social support and physical activity. Interventions that focus on building, strengthening, and maintaining social networks can motivate people to engage in more physical activity. The increased community support and availability of information is what makes these programs successful. Examples include setting up a buddy system, making contracts with others to complete specified levels of physical activity, or setting up walking or other groups to provide friendship and support. Social support interventions can take place within a community or can be offered through health care systems. Western Maryland Health System (WMHS), a comprehensive health organization serving counties in Maryland, West Virginia, and Pennsylvania, secured more than 12 partnerships with local organizations as diverse as the Allegany County Board of Education, the Country Club Mall, and the YMCA. Two “mall movers” walking groups encourage community-wide organized physical activity, social support, and enhanced access to local facilities. WMHS was able to prove to private organizations and insurance providers that the program increased physical activity, and successfully secured grants to fund future programs. These programs can be replicated in communities, particularly those with local health providers directly involved in their communities. Many counties profiled in the Bright Spot case studies report prioritize community development and participation, indicating that fostering social support is a promising strategy that can be replicated in other Appalachian communities. The Community Preventive Services Task Force (CPSTF) found compelling evidence that the use of technology such as activity monitors was helpful in increasing physical activity. These interventions expand access to support and professional advice through technology such as computers, video-conferencing, digital assistance, or mobile applications. The technological aspect makes social support and expertise available to people regardless of their location or work schedule. These interventions could be integrated with current worksite wellness programs and be part of a larger multicomponent coaching intervention. In 2013, IBM provided all employees with a Fitbit to track their progress. The program included activity challenges where employees could earn points. It also included a social media component where employees could seek advice and help with other users online. The technology and/or online community aspect of this program could be integrated into new or existing community wellness programs. An example of multicomponent health coaching can be seen in Fit for Life, a program sponsored by Trinity Hospital in Tuscarawas County, Ohio. The goal of the program is to provide an innovative multi-agency means to reduce the number of overweight and obese men and women in Tuscarawas County and surrounding counties of Carroll, Guernsey, and Harrison. The initiative offers “fit for life” classes, health risk assessment, and more for the community and workplace. Although the program started as a private hospital initiative, the success of the first round convinced funders to expand the program to businesses as well. The CDC’s Worksite Scorecard includes examples of worksite programs and a tool to evaluate existing programs. The CDC guide to Strategies to Increase Physical Activities in the Community offers guidance on best practices and potential strategies. Funders throughout the Region have the opportunity to invest in initiatives and activities to improve outcomes related to obesity and related diseases across Appalachia. Below, we describe strategies for funders and how they can make a difference in reducing health disparities related to obesity in the Appalachian Region. Funders can leverage existing programs, practices, and policies by promoting the replication and adoption of successful programs and strategies. Appalachian communities have many assets that should be recognized and promoted. Community members are often connected through volunteering and coalition building. They also build strong social connections through faith- and community-based organizations, schools, local businesses, and shared culture and history. Funders can expand programs such as healthy mobile markets and fresh food financing to additional communities. Funders can strengthen community implementation capacity in Appalachian communities. Opportunities to increase capacity include 1) enhancing individual-level knowledge and skills that facilitate community action, and 2) fostering organizational and systems-level capacity. Examples of organizational and systems-level capacity include engaging in community visioning and strategic planning, building networks and engaging community stakeholders, writing grants, and engaging in local and regional policy advocacy, such as creating incentives for local farms to distribute locally or developing joint use agreements with schools. Funders can help facilitate collaboration between community members, the public, and private-sector individuals, which is critical to addressing obesity within the Region. Through a coordinated use of resources, leadership, and action, communities can work together towards a common goal, using multiple perspectives and different areas of expertise. Government, the health care system, schools, private businesses, and community organizations all have critical roles in this effort. Funders can also play a role in helping key players collaborate through the funding of regional conferences or technical assistance. The Bright Spot case studies report identified examples of promising practices to improve outcomes related to obesity and related diseases in Appalachian communities. However, these programs and their outcomes are often not well documented. For long-term changes to occur, successful programs need to be evaluated rigorously and shared widely. Funders should encourage evaluation among their grantees to ensure program effectiveness is measured and documented. Evaluation, along with increased efforts to document local successes, will provide a more robust evidence base for Appalachian-specific programs and policies to improve outcomes related to obesity and related diseases. One tool to assist grantees is the Rural Health Promotion and Disease Prevention Toolkit, which has a module devoted to evaluation. Also, the Rural Health Information (RHI) Hub has tools for dissemination that can help grantees and funders identify ways to highlight their work related to obesity and obesity-related diseases. Bauer, U. E., Briss P. A, Goodman R. A., & Bowman, B. A. (2014). Prevention of chronic disease in the 21st century: Elimination of the leading preventable causes of premature death and disability in the USA. Lancet, 384(9937), 45-52. doi:10.1016/S0140-6736(14)60648-6. Finkelstein, E., Troqdon, J., Cohen J., & Dietz, W. (2009). Annual medical spending attributable to obesity. Health Affairs, 28(5), w822-31. doi:10.1377/hlthaff.28.5.w822. Cawley, J., & Meyerhoefer, C. (2012). The medical care costs of obesity: An instrumental variables approach. Journal of Health Economics, 31(1), 219-230. doi:10.1016/j.jhealeco.2011.10.003. Hales, C. M., Carroll, M. D., Fryar, C. D., & Ogden, C.L. (2017). Prevalence of obesity among adults and youth: United States, 2015–2016. NCHS Data Brief, No 288. Hyattsville, MD: National Center for Health Statistics. doi:10.1017/S1368980017000088. Across the United States, obesity prevalence has increased since 2012; therefore, the percentage of obese adults in Appalachia has likely increased as well. Appalachian Regional Commission. (n.d.). Distressed counties program. Retrieved from: https://www.arc.gov/program_areas/index.asp?PROGRAM_AREA_ID=15. Centers for Disease Control and Prevention. (2017). Appalachian diabetes control and translation project. Retrieved from: https://www.cdc.gov/diabetes/programs/appalachian.html. North Carolina Department of Health and Human Services Division of Public Health. (2014). Community health assessment guide. Retrieved from: https://publichealth.nc.gov/lhd/docs/cha/Archived-CHA-Guidebook.pdf. Centers for Disease Control and Prevention. (2017). Helping young children thrive in the early care and education (ECE) setting. Retrieved from: https://www.cdc.gov/obesity/downloads/Early-Care-Education-ECE-WEB-508.pdf. The Nemours Foundation. (2012). Collaborative & the ECELC project. Retrieved from: https://healthykidshealthyfuture.org/about-ecelc/national-project/. Centers for Disease Control and Prevention. (2017). Acting early to prevent obesity. Retrieved from: https://www.cdc.gov/obesity/downloads/acting-early-to-prevent-obesity.pdf. United States Department of Agriculture. (2018). School meals: Child nutrition programs. Retrieved from: https://www.fns.usda.gov/school-meals/child-nutrition-programs. United States Department of Agriculture. (2018). School meals: Smart snacks. Retrieved from: https://www.fns.usda.gov/school-meals/tools-schools-focusing-smart-snacks. Slusser, W. M., Cumberland, W. G., Browdy, B. L., Lange, L., & Neumann, C. (2007). A school salad bar increases frequency of fruit and vegetable consumption among children living in low-income households. Public Health Nutrition, 10(12), 1490-1496. Smith, L. H., & Holloman, C. (2014). Piloting “sodabriety”: A school-based intervention to impact sugar-sweetened beverage consumption in rural Appalachian high schools. Journal of School Health, 84(3), 177-184. doi:10.1111/josh.12134. Department of Health and Human Services. (2018). Physical activity guidelines for Americans. Retrieved from: https://health.gov/paguidelines/second-edition/pdf/Physical_Activity_Guidelines_2nd_edition.pdf. Centers for Disease Control and Prevention. (n.d.). The surgeon general is calling on schools to step it up! Retrieved from: https://www.cdc.gov/physicalactivity/walking/call-to-action/pdf/schools.pdf. The Community Guide. (n.d.). New recommendation highlights importance of enhanced school-based physical education. Retrieved from: https://www.thecommunityguide.org/content/new-recommendation-highlights-importance-enhanced-school-based-physical-education. West Virginia Food and Farm Coalition. (n.d.). Kanawha Valley Local Food Project. Retrieved from: https://www.wvfoodandfarm.org/kanawha-valley-local-food-project.html. YMCA of Western North Carolina. (2018). Mobile units. Retrieved from: https://www.ymcawnc.org/programs/community/nutrition-outreach/mobile-units. Senate Bill 25. (2017). West Virginia Legislature. Retrieved from: http://www.wvlegislature.gov/Bill_Status/bills_text.cfm?billdoc=SB25%20enr.htm&yr=2017&sesstype=RS&i=25. West Virginia Food and Farm Coalition. (n.d.). State policy wins. Retrieved from: https://www.wvfoodandfarm.org/state-policy-wins.html. Bartlett, S., Klerman, J., Olsho, L., et al. (2014). Evaluation of the healthy incentives pilot (HIP): Final report [Internet]. Washington, D.C.: U.S. Department of Agriculture, Food and Nutrition Service. Retrieved from: https://fnsprod.azureedge.net/sites/default/files/ops/HIP-Final.pdf. Reinvestment Fund. (n.d.). Success story: Pennsylvania fresh food financing initiative. Retrieved from: https://www.reinvestment.com/success-story/pennsylvania-fresh-food-financing-initiative/. ChangeLab Solutions. (2012). Getting to grocery: Tools for attracting health food retail to underserved neighborhoods. Retrieved from: http://www.changelabsolutions.org/publications/getting-grocery. Office of Disease Prevention and Health Promotion. (2018). The role of law and policy in achieving the Healthy People 2020 nutrition and weight status goals of increased fruit and vegetable intake in the United States. Retrieved from: https://www.healthypeople.gov/sites/default/files/LawHealthPolicy_Report_2018.10.pdf. University of Michigan Health System. (2013). Drink to your health: UMHS healthy beverage program. Retrieved from: http://www.med.umich.edu/1libr/Nutrition/HealthyBeverageProgram.pdf. West Virginia Center on Budget and Policy. (2018). Sugary sweetened beverage taxes provide health and revenue benefit. Retrieved from: https://wvpolicy.org/wp-content/uploads/2019/01/Sugary_Sweetened_Beverage_Taxes_FINAL.pdf. Brownson, R. C., Baker, E. A., Housemann, R. A., Brennan, & L. K., Bacak, S. J. (2001). Environmental and policy determinants of physical activity in the United States. American Journal of Public Health, 91(12), 1995–2003. The Community Guide. (2001). Physical activity: Creating or improving places for physical activity. Retrieved from: https://www.thecommunityguide.org/findings/physical-activity-creating-or-improving-places-physical-activity. Foundation for a Healthy Kentucky. (n.d.). Investing in Kentucky’s future. Retrieved from: https://www.healthy-ky.org/about-us/current-initiatives/investing-in-kentucky-s-future. Foundation for a Healthy Kentucky. (2016). Investing in Kentucky’s future: Evaluation update. Retrieved from: https://www.healthy-ky.org/res/uploads/media/IKF-2016-Evaluation-Update-FINAL_090716.pdf. Smart Growth America. (n.d.). The ten elements of a complete streets policy. Retrieved from: https://smartgrowthamerica.org/resources/the-ten-elements-of-a-complete-streets-policy/. Centers for Disease Control and Prevention. (2018). Health impact in 5 years. Retrieved from: https://www.cdc.gov/policy/hst/hi5/index.html. Pew Charitable Trusts. (2012). Kentucky worksite wellness tax credit: A health impact assessment. Retrieved from: https://www.pewtrusts.org/~/media/assets/2012/01/01/kentuckyworksitewellnesstaxhia.pdf. Association of State and Territorial Health Officials. (2012). Kentucky: Partnership explores health impact of worksite wellness tax credit. Retrieved from: http://www.astho.org/Programs/Prevention/Worksite-Wellness/Case-Studies/Kentucky-HIA/. The Community Guide. (2001). Physical activity: Community-wide campaigns. Retrieved from: https://www.thecommunityguide.org/findings/physical-activity-community-wide-campaigns. The Community Guide. (2001). Physical activity: Social support interventions in community settings. Retrieved from: https://www.thecommunityguide.org/findings/physical-activity-social-support-interventions-community-settings. The Community Guide. (2001). Physical activity: Creating or improving places for physical activity. The Community Guide. (2012). Mobilizing funding support to battle overweight and obesity. Retrieved from: https://www.thecommunityguide.org/sites/default/files/assets/Obesity-MD_0.pdf. The Community Guide. (2009). Obesity: Technology-supported multicomponent coaching or counseling interventions to reduce weight. Retrieved from: https://www.thecommunityguide.org/findings/obesity-technology-supported-multicomponent-coaching-or-counseling-interventions-reduce. The Community Guide. (2015). Using innovative technology to increase physical activity. Retrieved from: https://www.thecommunityguide.org/sites/default/files/assets/PhysicalActivity-IBM_0.pdf. Rural Health Information Hub. (2016). Change from the inside out: Ohio wellness program inspires healthy bodies through healthy minds. Retrieved from: https://www.ruralhealthinfo.org/rural-monitor/twin-citys-fit-for-life/.